Vegetables: It’s what’s for dinner. I have had gazpacho on the BRAIN. Caps, for emphasis. As in, I mentioned to Michael several times that I might make it, would make it, was planning on making it. On Sunday, we stopped by a farm stand post-beach, and I bought a pound of tomatoes. These were not just for salads. These were my gazpacho tomatoes. We also had kale. And Michael was asking for kale chips, again. We really do love them! I know lots of bloggers make kale chips (and green monsters, and overnight oats, and the like…and yes, I like them all!) and it’s KIND OF overdone, but hey. I’m showing mine off anyway. This gazpacho was inspired by The Curvy Carrot. I like my soups kind of chunky and stew like – even in a gazpacho. Certainly puree yours more if you don’t. In food processor, combine tomatoes and cucumber and pulse until desired consistency. Pour into bowl. Add remaining ingredients, spices and water. Adjust salt and pepper to taste. I let it sit for 30 minutes before serving. Preheat oven to 400. In a large baggie, throw in all your kale and coconut oil. Seal bag and shake it up to coat all the leaves. 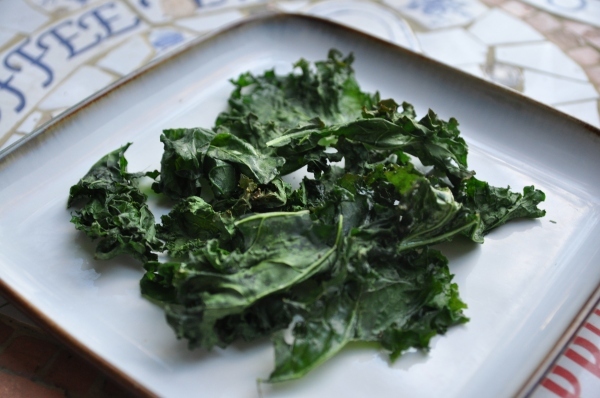 Line a baking dish with parchment paper or tinfoil, and invert the bag and spread out the kale. 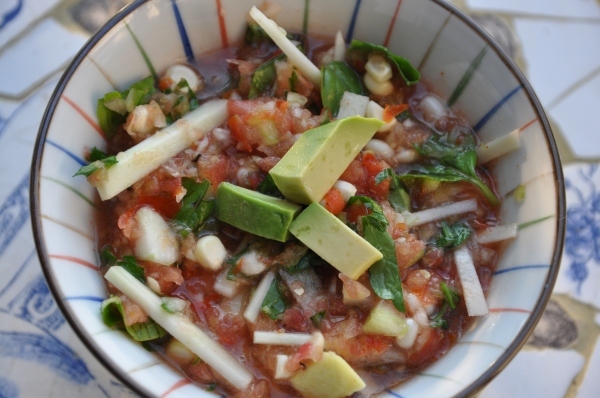 This entry was posted in Recipes and tagged corn, CSA, cucumbers, gazpacho, kale, tomatoes by NicoleW. Bookmark the permalink.